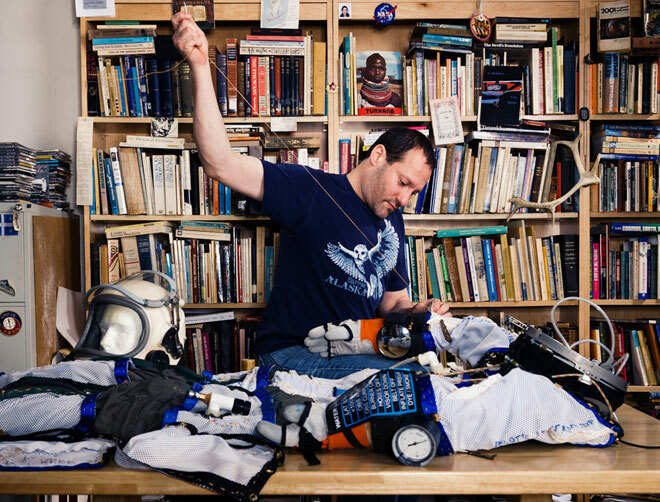 CAMERON M. SMITH at home working on his DIY Spacesuit. Wearing his spacesuit at his home in Portland. Taking a balloon up into the lower stratosphere may seem crazy, but to Cameron M. Smith it’s an opportunity to fulfill a lifelong dream. The 45-year-old Portland State University anthropologist couldn’t join NASA’s aviation program because of his poor eyesight. Lacking the funds to buy a ticket on a private space flight, he decided to take matters into his own hands. 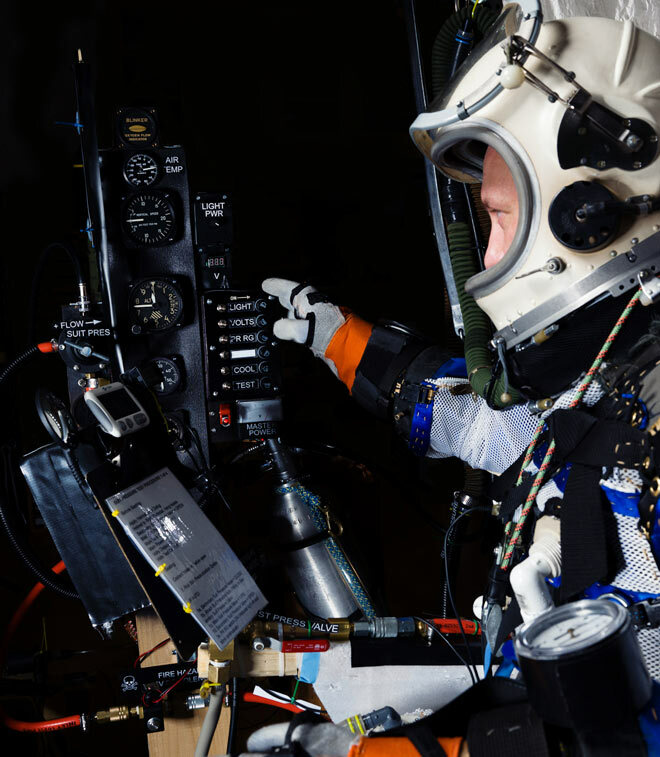 At 50,000 feet up, death is imminent, so the first thing to do was build a suit. Smith bought some of the parts off the Internet: a diver’s dry suit, a gauge that measures internal air pressure, and an aquarium pump to circulate cooling fluid. Ace Hardware had other bits like nylon straps, wire, and a slew of PVC fittings and valves. 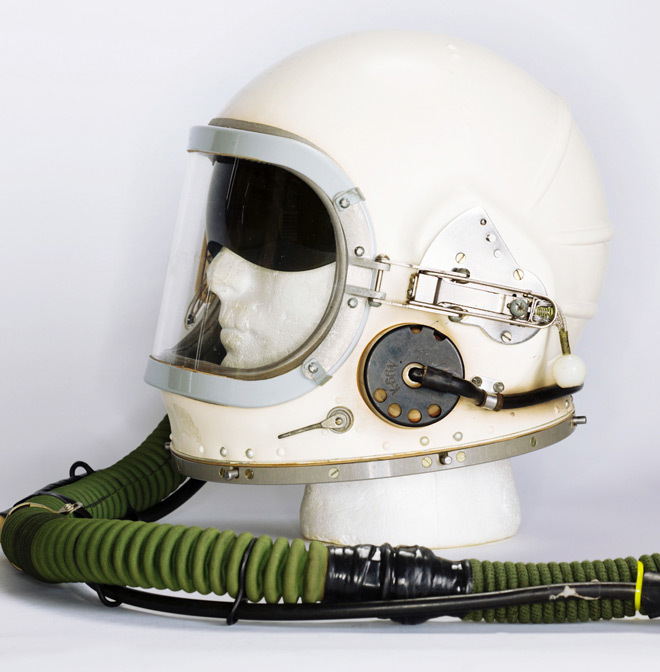 It’s topped off with an authentic 1980s-era soviet fighter helmet. 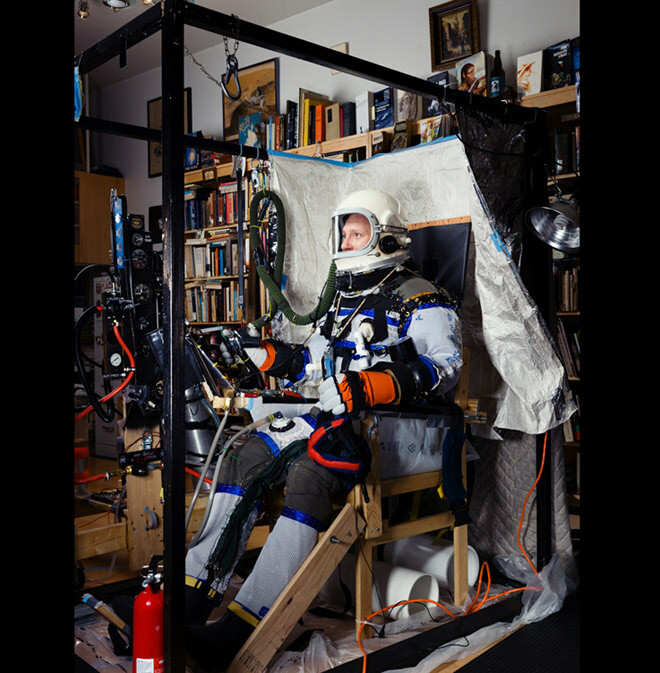 Once the proof-of-concept suit is complete, Smith will test his rig in a hypobaric chamber, and if all goes well it will be rebuilt with sturdier elements. Then he’ll craft a nylon balloon, get a balloon pilot’s license, and clear his route with authorities. 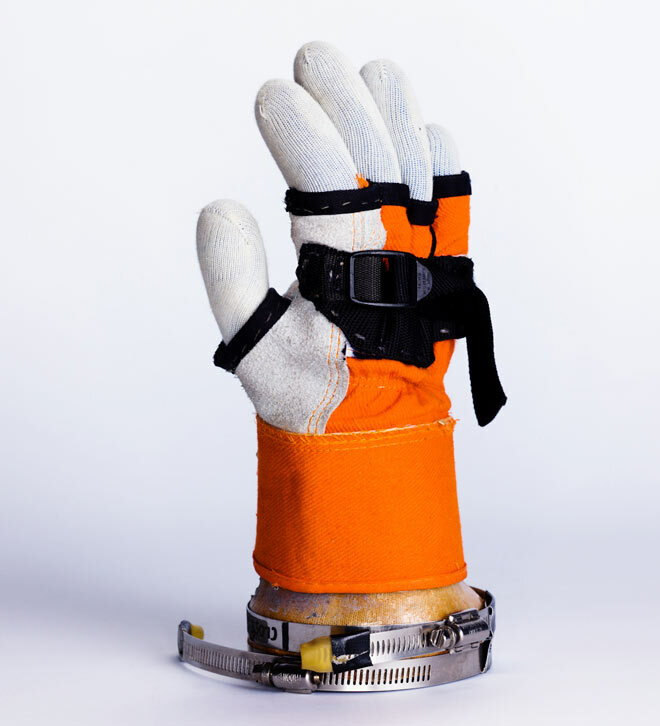 “If they could do this in the 1930s with rubberized canvas and pigskin gloves, surely I can do it now with the technology available,” Smith says. “This is not so crazy. This is not so wild.” Sure. We’ll just stay on the ground and watch from here, thanks. This article was originally published August 17, 2012.
recently got permission to 'liberate' some materials from an abandoned sailmaker's workshop--scored some great textiles and unusual tools -- thanks team members Michael R and Joseph P! few pictures from flying operations this past summer; Trent T and a dust devil while refueling; view in my wrist mirror, helpful! ; dawn balloon layout; ascent on a training flight (unpressurized)! can't wait to get flying again! 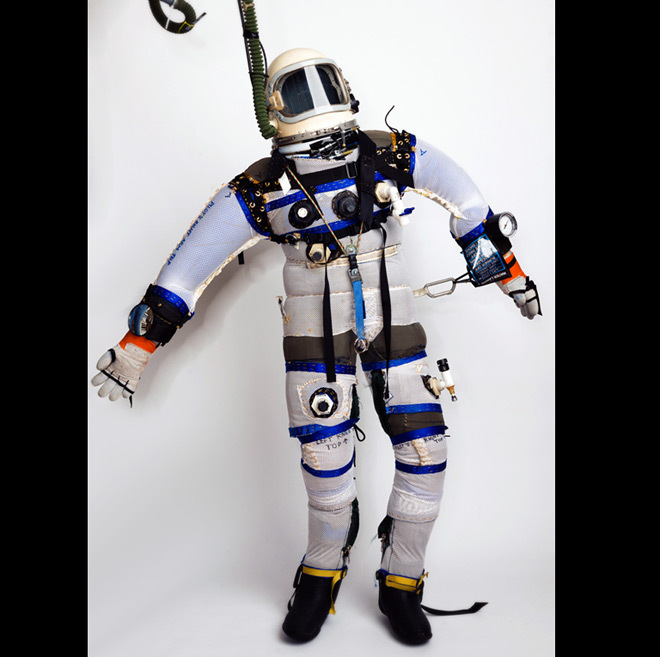 back to the MESS (Mars Exploration Suit System)! elbow segments are slow, mostly by hand as thick layers break sewing machine needles. also team member Michael R trying on the MESS suit! must complete by end of May! from our visit; ASU @SESEASU grad students had a fun look at our old (2009) Mark I suit and gave us good info on low-temperature gaskets! scale model of Prof Jacobs' radio telescope (dino for scale!) & pic of it; Trent & Mru with her radio-telescope calibration drone! another great visit to talk at Arizona State University's @SESEASU School of Earth and Space Exploration! demonstrated suit for a class, then Engineer's Coffee! thanks @tanyaofmars for the kind invitation!